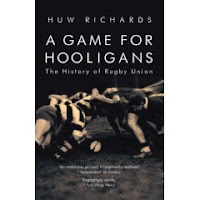 I’ve just finished reading “A Game for Hooligans: The History of Rugby Union” by Huw Richards, rugby writer for the Financial Times. It’s publicity bills the book as “an authoritative English-language general history of the game” and you really can’t argue with that statement as the book is packed with facts and information covering not only Britain and France but also the great rugby powers of the southern hemisphere and other successful rugby nations. The book looks at the origins of rugby, takes the reader through the traumatic events surrounding the breakaway of the Northern Union in 1895 and plots a journey through the decades, its final destination being the 2007 Rugby World Cup. 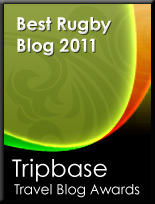 It is certainly impressive, and if you enjoy soaking up rugby facts then this is the book for you. I have to admit, however, that I did find the book hard work – possibly because it does bombard the reader with information and, at under 300 pages in length, rattles through the years so quickly at times that it’s difficult to absorb the data being presented. At times I just wanted the book to slow down and explore some of the events in a little more detail and, although the blurb claims that the book does contain a “wealth of anecdotes”, many of these are lost amidst the headlong dash through history. I certainly can’t fault Richards’ effort here – the research involved must have been a huge endeavour - I only wish I’d enjoyed reading the book a little more. 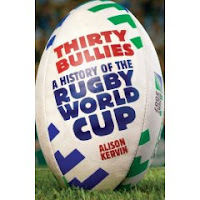 By way of contrast, a book I read earlier this year, “Thirty Bullies: A History of the Rugby World Cup” by former Times and Rugby World editor Alison Kervin is, in many ways, a far more enjoyable read. Admittedly Kervin only had to cover a 20 year period compared to the 150 years or so chronicled in Richards’ book, but nevertheless “Thirty Bullies” focuses largely on the various World Cup tournaments from the players’ perspective – from those (mostly English it seems) players who drank their way through the 1987 tournament to the highly trained athletes at the 2003 event (the book having been published to coincide with the 2007 World Cup). My only problem with the book is the author’s tendency to try to over-analyse the reasons for the winning team’s success at each World Cup (she comes up with the stunningly original conclusion that each Rugby World Cup has been won by the best-prepared team) but, despite this, the book remains a hugely entertaining read. If it’s facts you want – “A Game for Hooligans” is the book for you, but for pure entertainment value “Thirty Bullies” wins hands down. Thanks for the reviews, Flanker. I will have to see when these are available in the States. I have been slogging through the French book translated as "The Rugby Lovers Dictionary", which is chock full of good stories from the gaellic perspective.